It was time. It was God’s time to continue with His plan of salvation by picking out an individual who would be the father of faith for all who would be justified in God’s sight. This continuation started with Shem, the father of the Semitic peoples. His family line continued nine generations to Abram, and Abram (“high father”) would become Abraham (“father of a multitude)—the father of the Hebrew and Arab people. Abraham is a huge Biblical figure, being the father of faith to all who believe—whether Jew or Gentile (Romans 4:16; Galatians 3:7-9). Ultimately, Abraham’s family line would continue all the way to Jesus Christ, the Hebrew Messiah and Savior of the whole world (Matthew 1:1-17; Luke 3:23-38; 1 John 2:2). 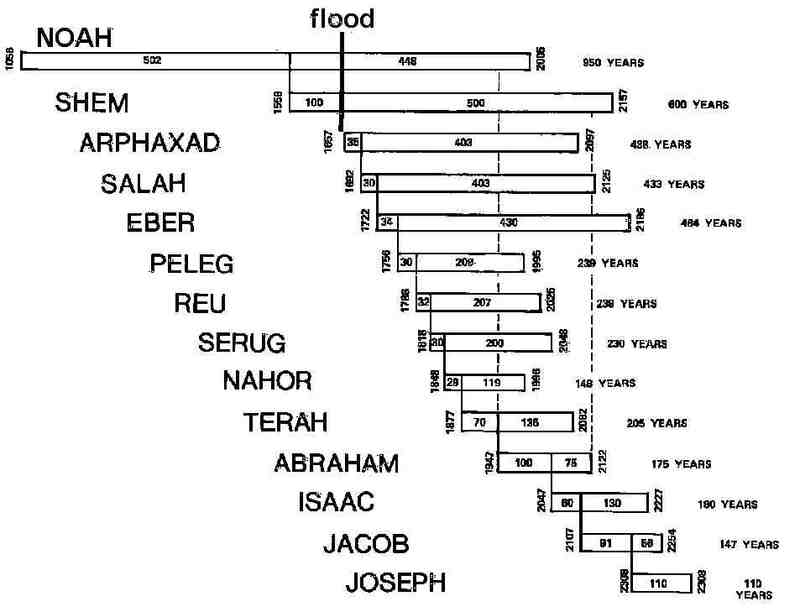 Looking at a graphic of the overall lifespans from Noah to Jacob’s son Joseph, one can see that Shem was alive for Abraham’s entire lifetime … due to the fact that Shem lived to be 600, while Abraham lived to be “only” 175. Another interesting chronological note: Noah also was still alive by the time Abraham was born! What this shows is that there was contact from generation to generation in those days. Therefore, God’s truth and deeds could easily be preserved and furthered. God still works His plan through willing human beings. Shem showed fear and respect for God by covering his father Noah rather than exposing him as Ham had done, and God used him. Abraham lived a godly life and was obviously a willing vessel, bringing glory to God (Matthew 5:16). 1. Consider the historical events leading up to Abraham … the creation, the fall, the beginnings of civilization, the universal spread of depravity, the flood, the earth’s repopulation, the tower of Babel, God’s judgment which brought the confusion of languages and the geographical spread of the world’s population. Spend some time meditating on the big picture of the mercy and patience of God. Praise Him for His longsuffering nature. 2. Why was Abraham an important historical figure? What does his life mean in relationship to plan of salvation for the whole world? 3. Have you ordered your life that you may be a willing and available vessel for God’s purposes? What can you do to ensure that God can use you? Thanks Bill! Your devo reinforces the importance of passing our faith from generation to generation. Noah must have had a huge impact on his kids and great grand kids. You’re welcome, Dean. Yes, you’re right. Great reminder of that … good word for my heart even this day! Bill, I totally agree with the idea that facts and faith were passed down in those early generations, however, in order for Stephen to be telling the truth in Acts 7, Abraham had to be born when Terah was 130, not 70. This does not contradict Gen 11:26, because it is very possible that Abraham was not firstborn, just as Shem was not, nor was he likely born in the same year as his two brothers. Have a look at the explanation at http://www.apologeticspress.org/apcontent.aspx?category=6&article=758 and see what you think. It preserves inerrancy and authority of Scripture. Please redo your chart with Abraham born 60 years later and Terah dying before Abraham leaves Haran and begets Isaac.